Thanks to multiple recommendations and quite explicit directions, I made it to the legendary Tomato fabric store in Nippori Textile Town. That's the cotton floor, above. Anyway, despite having to take the slow train back to Narita late Monday night (I missed the last express), I managed to go everywhere I wanted *and* get back to the airport in time to make my flight to Taipei. 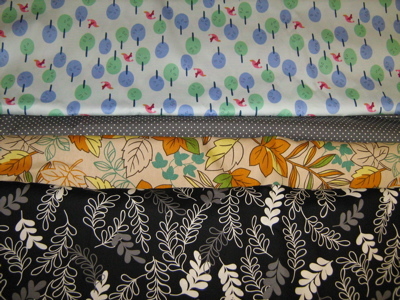 So, from the top down — probably the most "Japanese" of the fabric I bought, the little birds and trees on heavy cotton. Heavier than quilting cotton, anyway. I deliberately didn't buy anything self-consciously Japanese: no kanji prints, no geishas, no "Engrish" writing. I wanted cute, but not "kawaii! ", if that makes any sense. Also, as hard as it was to resist, I didn't buy anything Hello Kitty. The gray dot is probably has a good bit of polyester in it, and it has a small flaw, but it was 100 yen/yard and the dots are really nice, not the bad printing I usually see in the US. 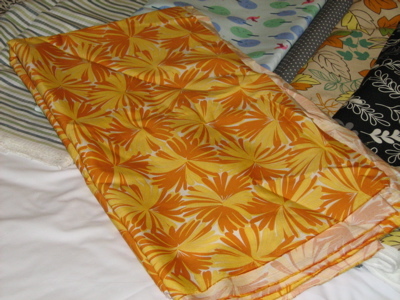 The autumn-leaf print is very heavy, almost upholstery weight, so I think that will be a skirt. It think it would be cute with an orange corduroy jacket and green tights in the fall … although in 90+ degree Taipei, it is *very* difficult to think about fall! The black and gray leaf print just *spoke* to me, which black fabric hardly ever does. And who am I not to listen when Japanese fabric wants to emigrate? I had to buy it. 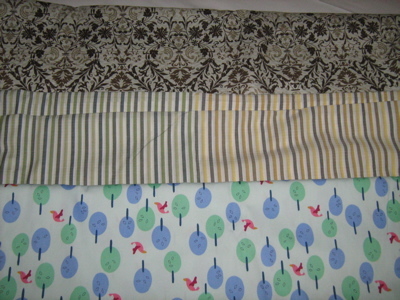 The stripe is a shirting stripe and it's green/gray on one half and yellow-gray on the other. I thought I was hallucinating when I pulled it out; I pulled out the green side and, then, clutching the bolt, only saw the yellow; I enjoyed a brief moment of panic while I wondered where the green fabric went! Do I have any idea how to sew this? No, I do not. But for 100 yen/yard, I figured it would come to me. Someday. I'll wait. Despite the notorious expensiveness of everything in Japan, I think I spent less than $125. Although I probably spent at least half that on train tickets …. Thanks again to all the folks who sent me recommendations and directions for my all-too-brief time in Tokyo … I can't wait to go back! Eeks! Photos are not showing! Wahhh. oh no! They’re showing for me … reload? I *love* the little red birds.I like the black/grey/white leaves, too — it’s like a black fabric that’s not taking itself too seriously. No photos here, either, even after reload. Anxiously awaiting the view! I love each and every one of them, well done. Ahh. All better now. Beautiful fabrics (she says with a just a hint of jealousy).About the IE vs, Firefox;I’m the ‘puter fix-it person in my household. If I changed the browser, it would undermine my hard-won success in getting BF to not download anything ever again without checking with me. I’ll limp along & not complain – I love your site too much! I use Opera as a browser. I’ve never had trouble on your site. I’m one of those people that doesn’t wear dresses, but I love your site. My mom hates that I’ve decided to try to learn to sew, and all for that Butterick wrap dress. Beautiful- especially the autumn leaves. That’s my favorite. Fun! I especially the trees and the black and gray leafy ones. I LOVE JAPAN!! That country has everything you never knew you needed. I once spent $80 on paper at Tokyu Hands. To do what with…that is still to be determined! Nice work! I have a lot of sympathetic joy for your fabric finds.Running around a city where I don’t speak the language and being pursued by shadowy figures who don’t want me to buy fabric sounds like a typical dream plot. I’d definitely shell out for the movie version, if it were a Jacques Demi musical (a la “Demoiselles de Rochefort”) or maybe a Charlie Kaufman film. You hit the jackpot! I can’t wait to see what you do with all this stuff! We are so lucky here in Texas. 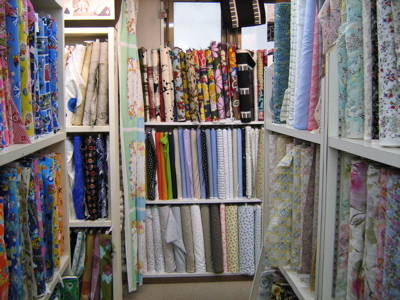 We can get those fabrics at fabric outlet malls in Dallas and Houston – the same fabric – for much lower prices and don’t have to carry it all the way home from overseas. Happy travelling! OK, I’m culturally deficient. Just how much is 100yen/yard? That black and white leaf print, looks very much like a fabric I have seen elsewhere–perhaps one on the sewing magazines? Your taste in colors and prints, aren’t mine, but I defend your right to love them! I still have a great big splashy print I picked up in Antigua 17 years ago and have never made anything with it yet. Hubby thinks it would kind of overwhelm me but it is crying to be made and worn. My favorite is the birds and trees. I am always buying decorator fabric for dresses. I keep having vivid dreams about patterns and sewing. (Especially the latest Butterick wrap featured.) Maybe I will dream the movie of Erin and the shadowy figures thwarting her fabric shopping. She has to get a certain fabric to make the uniforms for Captainatrix and the Chicanauts and save the world from the evil Polly Esther, who is trying to force everyone on the planet to wear double knit polyester leisure suits! I like the fabric with the orangey leaves in the first photo. And that little grey van in the last. Where can I get a van like that? 100yen is 80cents US, is that right?Cool fabrics! I am most thoroughly jealous. When I was in Japan I was quite poor and could only look at the lovley fabrics. Went to an interesting Indigo Dying place somewhere in Kyushuu. My personal favorites: the black/white leaves; the damask/Renassaince-looking weave; and, oddly, the yellow/orange chrysanthemummy thing. I apparently have a long-running love and/or obsession with foliage and foliate designs. Renaissance? You betcha! Turkish? Why not! Japanese? Sure! Just leaf them for me.Seriously, some mighty good hunting! I congratulate and envy you (in a wholesome way). Ugh. You know that first one was supposed to be “Renaissance,” right? Too early in the morning for me! I LOVE the little birds. I love fabrics that make me giggle uncontrollably. ladygrande —There are fabric outlet malls in Houston and Dallas? Where, please please. 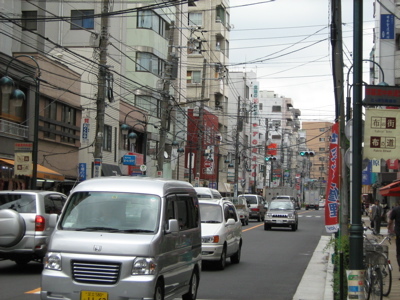 at the current exchange, 1$ = around 118yen. Doing the math, 100yen is about 85cents.Seems like you use a lot of Cotton for your dresses, but do you use Polyester? Satins for making evening dresses?? I export fabrics out of Japan. If you are looking for anything that you couldn’t find while you were here, let me know please. I didn’t know Japanese fabric could be so cheap! I always thought they were expensive. Eighty cents? Yes!!! 4qqLEZ Please write anything else!